Welcome to the Deccan plateau of India, embedded with a rich heritage and exciting landscapes, to add a new page in your life. 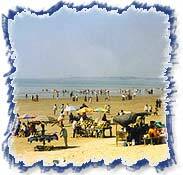 The tour package includes mainly the Southern part of India, with some of the most cherished tourist destinations. While at one hand you get the cosmopolitan Mumbai and Hyderabad, on the other there are splendid historical places like Hampi and Bidar. The tour is a flexible mix of modernity and ancient attractions that suits to every tourists' choices, if not the one then the other. Received at the airport by our representative, he will transfer to the hotel for overnight stay. Morning cruise across the Mumbai harbour to the Elephanta Island (9 kms) to see huge rock cut temple there. Afternoon city tour with visiting museum, Gate way of India, Hanging Garden, Tower of Silence, Dhobhi Ghats, Mani Bhawan etc. Overnight at hotel. Morning connect train for Aurangabad by train # 7617 Tapovan Express dep. 06:10 hrs / arr. 13:15 hrs. Check Into hotel. Afternoon city tour visiting Aurangabad Caves, Daulatabad Fort and Bibi Ka Muqbara. Overnight at the hotel. Morning excursion to Ajanta Caves. AJANTA is world's greatest historical monument recognized by UNESCO. There are 30 caves in Ajanta of which 9, 10, 19, 26 and 29 are chaitya-grihas and the rest are monasteries. These caves were discovered in AD 1819 and were built up in the earlier 2nd century BC-AD. Most of the paintings in Ajanta are right from 2nd century BC-AD and some of them about the fifth century AD and continued for the next two centuries. All paintings shows heavy religious influence and centre around Buddha, Bodhisattvas, incidents from the life of Buddha and the Jatakas. The paintings are executed on a ground of mud-plaster in the tempera technique. Drive back to hotel for overnight stay. Arrive Securandabad Junction at 09:10 hrs. Received at the railway station and transfer to hotel. Afternoon tour to the city takes you to Salarjung Museum, Charminar, Mecca Masjid, Laad Bazaar and Hussain Sagar Lake. Overnight at hotel in Hyderabad. Morning excursion to Golconda Fort. Later leave for Bidar (140 kms/3hrs). At Bidar visit with Rangin Mahal, Sola Kamabah Masjid, Gagan Mahal, Madrasa of Mahamud Gawan. Proceed drive to Gulbaraga (110 kms/2hrs). Overnight at Gulbarga. Morning tour of Gulbaraga a unique synthesis of two cultures. Start your tour with Fort, inside the fort is Jamma Masjid, Khawaja Bande Nawaz and Dargarh Library. Later drive to Bijapur (150 kms/3 hrs). Overnight at Bijapur. Later drive down to Badami (132kms/3 hrs) en-route visit Aihole as the "cradle of Indian architecture", Aihole has over 100 temples scattered around the village. Overnight at Badami Court. The capital of the early Chaulkyas, Badami is picturesquely situated at the mouth of a ravine between two rocky hills. 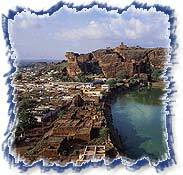 Badami is famous for it's four cave temples. Leave for Hospet (240 kms/6hrs) and en-route stop at Pattadakal situated on the bank of the Malarapbha river and has ten major temples representing early Chalukyan architecture. Overnight at Hospet. A base to take a tour of Hampi or Vijayanagara (1 hrs drive) one of the largest empires in the history of India- in ruins. Explore the ruined kingdom and return back to Hospet for overnight stay. Morning drive to Dandeli via the Jain temples at Lakundi and the cotton market at Gadag. Arrive Dandeli and check in at a Wildlife reserve. Afternoon enjoy a Jeep safari in the park. Morning enjoy Safari in the National park. Afternoon drive to Goa (125 kms / 3 hrs). Check into hotel. Evening free to relax on the beach. Overnight in hotel. Morning City sightseeing tour of Old Goa including Panaji is the capital of Goa and most Happening City. Mapusa Bazaar is considered as the oldest weekly fair on the Konkan Coast. Shri Mangesh Temple in Madgoa is the most sacred place for the Goanese Hindus. Shri Shanta Durga Temple is dedicated to Goddess of peace, Shanteri. Shri Ramanath Temple is a part of Shri Ramanath Panchayatan, a temple complex at Ponda. Day free for leisure or to stroll along the beach. In time transfer to airport to board flight to Mumbai. Arrive Mumbai and transfer to International airport to board flight for home.